He was born in Sarak village of Astara region on the 23rd of January, 1976. He finished secondary school in 1992 and later, obtained a profession of a driver in his own region. Yalchin was called for military service by the Military Commissariat of Astara region on the 19th of April, 1994. After he had two months training in Lokbatan district of Baki city, he continued serving first in Tartar and later in Shamakhi regions. The young soldier was a diligent person who was always fulfilling the assigned tasks in a timely manner. He had his own dreams and plans about his life after the Army. But unfortunately the fate already had another plans and the known March events took place. A group of armed traitors were trying to over through the Government and destroy newly established independent Republic. Though they were ordered to put their guns down and surrender, it did not give any results and the group did not want to surrender but shed blood. Thus, The National Army had to use force. Yalchin Nasirov as a brave soldier also fulfilled his duty in front of the country. He participated in all the operations held from 13th to 17th of March and on the 17th, he was severely wounded and lost a lot of blood. He was urgently rushed to Sabunchu region hospital but it was too late…the doctors were not able to save his life. He forever closed his eyes on the 24th of March. 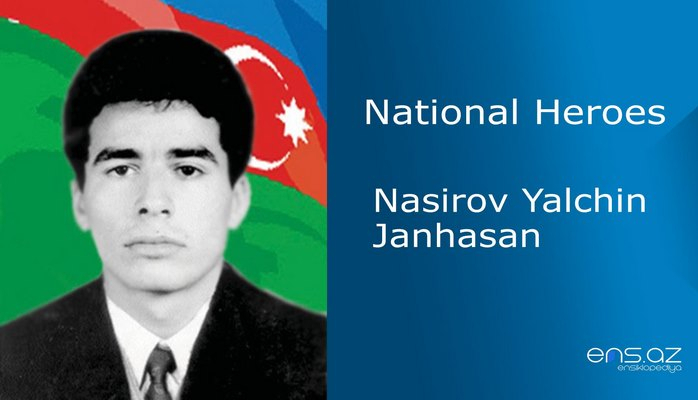 Nasirov Yalchin Janhasan was posthumously awarded the title of the “National Hero of Azerbaijan” by the decree # 307 of the president of Azerbaijani republic on the 4th April, 1995. He was buried in Sarak village. The secondary school of Sarak village is named after the hero. And his monument was built in the “Garden of the Heroes” in Astara region.